The JAX Chamber and the Jacksonville Women’s Business Center, a program of the JAX Chamber Foundation, will host the ATHENA International Leadership Awards Luncheon on Thursday, Oct. 18, from 11:30 a.m. to 1:30 p.m., at Bella Sera, 919 King St. in Jacksonville. ATHENA Founder Martha Mayhood Mertz will present the National Leadership Award to Bonnie Carroll, President and Founder of the Tragedy Assistance Program for Survivors (TAPS). 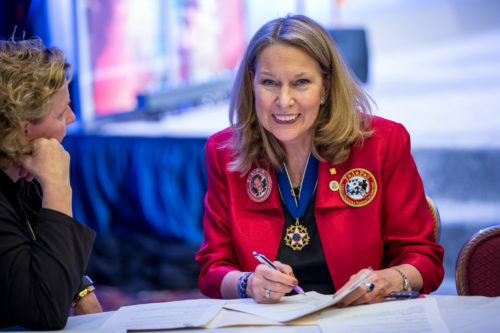 Carroll is being honored for her work with TAPS, the leading national organization providing compassionate care and survivor support services for the families of America’s fallen military heroes. Since 1994, TAPS has offered around-the-clock emotional support to all those impacted by the death of a military loved one. Carroll is a 2015 recipient of the Presidential Medal of Freedom, a military veteran and the surviving spouse of Brigadier General Tom Carroll, Army National Guard. Ms. Carroll founded TAPS following the death of her husband and seven other service members in an Army C-12 plane crash in November 1992. While grieving the death of her husband, Carroll found her greatest support in the connections she formed with the other surviving family members. This inspired her to build TAPS based on the concept of peer-based emotional support. Carroll divides time between her home in Anchorage, Alaska and the TAPS National Headquarters in Arlington, Virginia. The ATHENA Leadership Award is presented to a woman ­­–– or man –– who is honored for professional excellence, community service and for actively assisting women in their attainment of professional excellence and leadership skills. For more information about ATHENA International Leadership Awards Luncheon, contact the Jacksonville Women’s Business Center at 904-366-6640.